I'm trying to understand all primitives In this article.After hard work I just learn Sphere and Cube , I wrote description here. I can't imagine how this shape drew and I don't know why two length used here. I don't know why dot product used here? I'm confused please help me to understand this shapes.I hope someone explain each shape. A torus is defined by two parameters: the major radius, and the minor radius. The major radius (t.x) is the radius of the big ring (in red in the diagram), and the minor radius (t.y) is the radius of the circular cross-section. 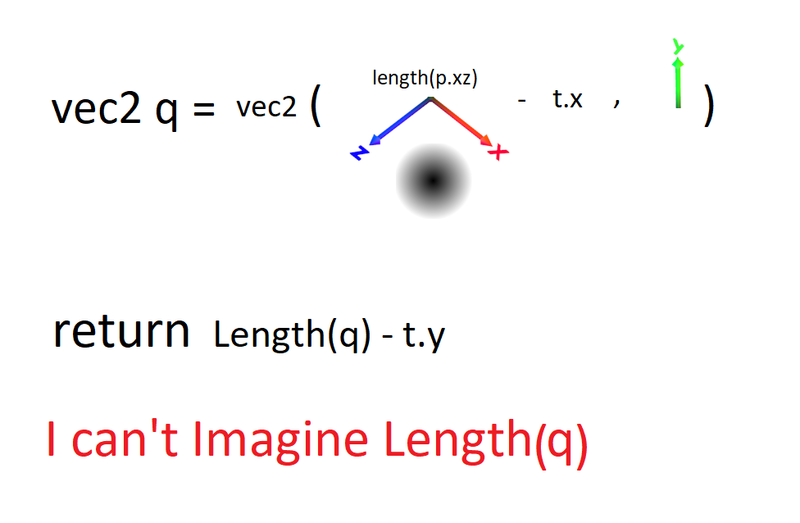 The x and y here are just indices into the vector: they're unrelated to the x and y axes. The left side of the diagram shows the xz plane, and the right side shows a cross-section with y going horizontally. Like the torus, the cone code uses the fact that the shape is symmetric about an axis: the z axis in this case. The cone is defined by a unit vector c that's normal to the surface of the cone, and the apex of the cone is at the origin. Similar to the above, length(p.xy) gets the distance from the point to the z axis, so that we can work in the plane where the cone is a triangle. vec2(q,p.z) is the projection of p into this plane. 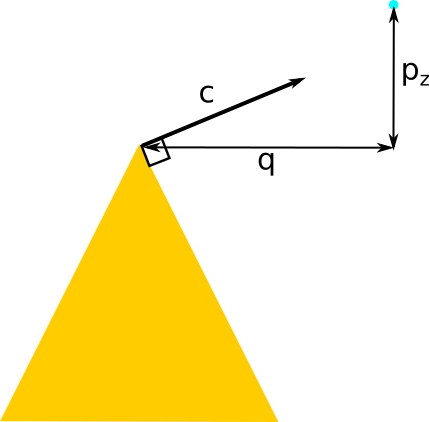 The dot product projects this vector onto the direction c: how far the point is along this direction tells us how far it is from the surface of the triangle. Not the answer you're looking for? Browse other questions tagged glsl mathematics signed-distance-field or ask your own question.